National University Honours Admission Circular 2018-19: NU Honors Admission Circular 2018-19 has been published on nu.ac.bd/admissions. nu.ac.bd is the official website of Natioanal University. We also updated National University Honours Admission Notice 2018-19 here. National University (NU) Honours Admission Notice 2018-19 is available at NU admission official website. National University, the largest public university of Bangladesh, invites online application from eligible candidates for admission into 4 years bachelor honours programs in different subjects. 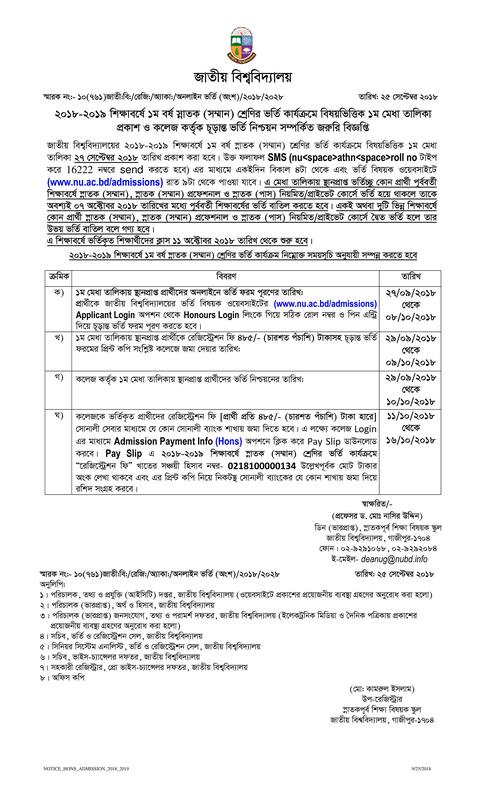 Interested candidate has to apply online via National University (NU) admission website www.nu.ac.bd/admissions. Nu admission merit list will be given on basis of SSC & HSC result. Eligibility for National University Honours Admission 2018-19: Candidates must pass SSC in 2015/2016 and HSC in 2017/ 2018. Applicants must have total GPA-4 (with 4th subject) both in SSC and HSC examination. Candidates must have at least GPA-2.0 (with 4th subjects) in both SSC and HSC each. See more details on the circular which can be checked from below. Students can Apply for Honours Admission by NU Official Admission portal admission.nu.ac.bd or app1.nu.edu.bd. 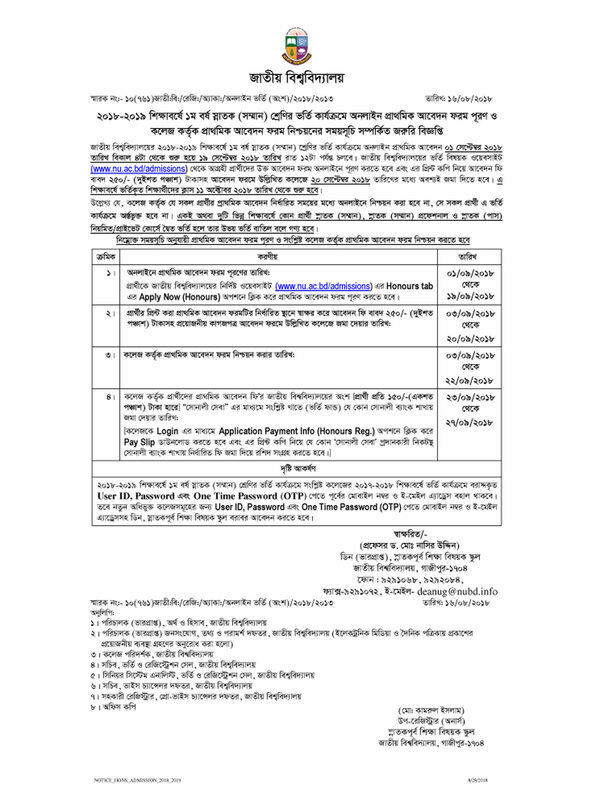 If you want to Apply for National University to Honours Admission for Affiliated College of National University Bangladesh you should follow the instruction. visit http://nu.ac.bd/admissions Select Honours Tab Left Sidebar. Input your SSC & HSC Roll, Board and Passing Year . In the Next Step Select DIVISION, DISTRICT and College and your preferred choice Subject. In the Next Step (If you have Quota) Select your Quota. In the Next Step Upload Your Photograph, Input Phone Number. Click Preview and Review it Frequently. Submit the Application Form and Print it Out. Finally Submit the Application Form with Required Documents and 250/= to your target college within 20 September, 2018. National University Honours Admission Result 2018-19. National University Honours Admission Result 2018-19 is announced on last week of September or, October first week 2018 through http://nu.ac.bd/admissions. National University Honours Admission Result 2018-19 will be found in these websites at www.nu.ac.bd/admissions, admissions.nu.edu.bd & our website at JobsGroup24.com too. We will publish this result in same time in our website. To Get Honors admission Release Slip Form, Students have to login web site by give admission test roll and Pin No. Then Students Will get Applicant name and Others details. They Will get Available College and Seat Number in College Option, Now Choice Your College and Fill Others information and submit application Form. Note: 1 Students Can Choice Maximum 5 college. So Be Aware, When Choose College. See Available Seat Number and Take Decision Carefully. All information about National University (NU) Honours Admission 2018-19 is available on National University (NU) admission official website nu.ac.bd/admissions. So you can visit National University (NU) website nu.ac.bd/admissions to get updated information regarding National University (NU) Honours 1st Year Admission 2018-19.